Games and fast food: It's a match made in heaven. Starting tomorrow, a PlayStation and Taco Bell promotion will give people a chance every 15 minutes until Nov. 10 to win a PS4. 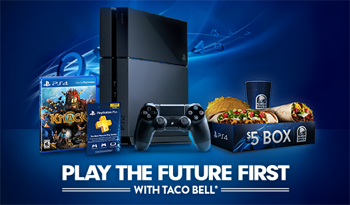 When purchasing a $5 Buck Box at Taco Bell, participants will receive a code on the box to text in for an entry to the PS4 giveaway. The prize pack includes one PlayStation 4, a copy of Knack, and a one year PS Plus membership. According to the official rules, there are also two ways to request a code without making a purchase at Taco Bell. The first is a mail-in request; until Oct. 28 participants can write their name, address, and email address on a stamped postcard and mail it to Play The Future First (address included in the official rules). This can be done 33 times total, and each time an administrator will email a code to the participant. The second way is to request a code online by Nov. 10. This can only be done once; however, the online code can be used once a day. The link for the online code is not yet active. Only one code can be submitted per day. Sony and Taco Bell partnered for the same promotion last year to promote the Vita, but it ended in much frustration for winning participants who said they never received their prize. Not all Taco Bells are participating, so make sure to check with your local store if you're interested in the promotion. The contest is only open to U.S. residents. Hopefully the promotion will go over smoothly this time.